When close friends shared they were headed to Belgium and wanted to meet somewhere we said yes! Cologne, Germany was the rendez-vous point from where we trained it to the picturesque town of Cochem in the upper Mosel Valley. The Valley is a zig-zag meandering gorge that the river carved, home to some of the worlds best Riesling wines and very steep vineyards – some up to a 60+ degree gradient! We traveled in the Mosel previously but were south. Once in Cochem and settled in, the guys chose to start with German beer. Laura joined them and I set out to find our group a wine experience. Weingut-Ring is conveniently located in the center of Cochem. Turns out the winemaker, Ulrich Ring, spends Sundays in his tasting room, preferring to meet and chat with people about wine. Our timing was good; we arrived Saturday afternoon and our hotel (highly recommended) was a quick 6-minute walk. Ulrich Ring – An encyclopedia of knowledge just waiting to be tapped! From Mosaik (on left) to Ars en Vitro (front right). Herr Ring worked with his father in the vineyard and cellar as a boy. In the early 80s after studying law, he went to Trier for oenology training. And at that time he started running the winery himself. Chatting with him he shared it’s been 40 years! Vineyard holdings are small, just 2.5 hectares with 70% mostly old vine Riesling (70 years+) on steep slopes. Riesling thrives in the cooler Mosel climate as a late budder (avoiding spring frosts) and late ripener (develops sugars and aromas while maintaining acid levels). He also grows Pinot Noir and Regent, which do well there organically. Ring contracts with neighboring growers to provide other grapes including Elbling, the oldest variety in the Mosel area. Ring makes about fourteen different Riesling wines from Kabinett, a dry (trocken) style to sweet Eiswein. Most are either Qualitäteswein (QbA) or Pradikatwien on the German wine quality pyramid. Pradikatswien is the most common designation you’ll find in the Mosel. The reds gracing his portfolio include Pinot Noir (Spätburgunder) and Regent. He makes other wines including two attention-grabbing white blends. Ring is an energetic man. After fielding a few technical questions and sensing our interest his energy turned attentive. A few of the twelve wines tasted follow below. A blend of pre-selected grapes from four of his very different Riesling plots. This is a dry Spätlese with an Auslese quality, meaning better grapes. Hints of petrol and lime give way to a bowl of fresh but ripe stone fruit, tangerine and lemon wrapped in a geranium and rose bouquet; zesty lemon-lime acidity is delicate and balanced with succulent peach-pear; saline quality on the lingering finish. It was this wine that converted our friends Mel and Laura into becoming Riesling lovers. A wine we agreed we could sip all night! We grabbed a few bottles for cellaring as it will only get better with a few years of age. Years ago at the Merano Wine Festival Ring met an Austrian winemaker who introduced him to “Wiener Gemischter Satz”. 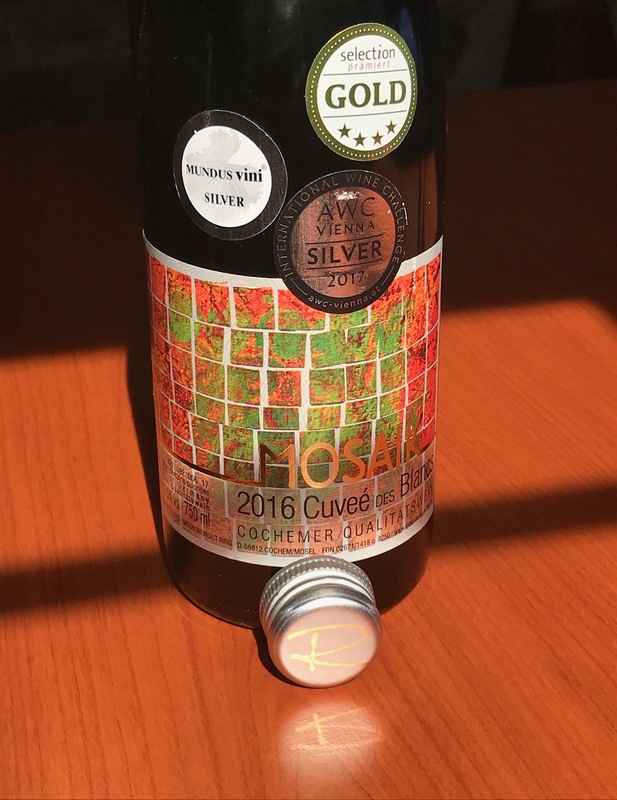 This is a unique field blended wine where different grapes are grown, processed and harvested together. Ring so liked the wine he transported the idea to his estate, creating a unique and emotional selling point for his wine MOSAIK. 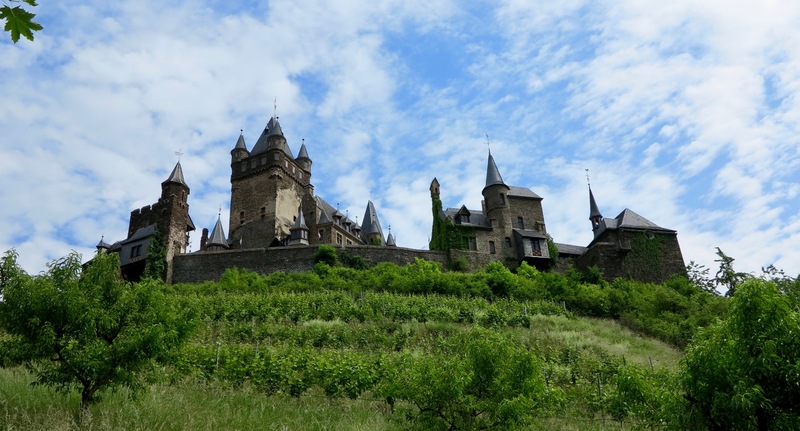 It stands apart from the plethora of wines in the Mosel Valley. A fabulous example of traditional Mosel grapes in a different style. Screw cap?!? Why yes! Many quality wineries utilize them. This is a field blend of seven varieties: Riesling (40%), Gewürztraminer, Scheurebe, Sylvaner, Sauvignon Blanc, Grüner Veltliner and Roter Elbling. Different grapes don’t ripen at the same time thus they harvest in two sweeps usually two to three weeks apart. Fermentation and vinification start and finish in small two- or three-use Burgundy barrels that previously held Chardonnay or Sauvignon Blanc. Aromas here reminded me of spring flowers after rain with a squeeze of citrus. The palate is brisk with lemon-lime, yellow apple, less ripe pineapple, notes of ginger and a dusty feel. Structurally it’s perfectly balanced with medium acidity, body and length. This is another unique wine that translates to “Art in Glass”. A selection of the best Riesling Auslese grapes from 70-year old vines selected then fermented and vinified in special barrels; Ring built these with non-toasted French oak staves and tops/bottoms of lightly toasted acacia. The wine spent 15-months in them before bottling. Medium intensity aromas have a slight petrol (oily) and creamy character giving way to mango and yellow flowers dusted ever so lightly with vanilla; palate has a slight tannic feel yet round with lime pith, pomelo and yellow stone fruit that lie atop a vein of minerality; bright acidity lifts the flavors on this medium body wine. Outstanding quality that could battle many more expensive Riesling! Beerenauslese is a style of dessert wine made with botrytized grapes. For the botrytis fungus, also known as “nobel rot” to grow (here’s a great description about botrytis from Wine Folly), you need cool, misty mornings and warm, dry autumn afternoons. 2010 hit a botrytis perfection peak then quality started to decline. Ring shared with us the story about this wine. “We had problems with too much botrytis that year. When my grapes were delivered, I looked into the box and saw 100% brown, dried botrytis grapes, many too far gone. I put the crates on the floor and from them spent the entire night selecting berries for this wine”. For Beerenauslese (and Trockenbeerenauslese) you need very good quality botrytized grapes. In 2010, although there was abundant botrytis, the quality wasn’t necessarily good thus the reason for sifting through the grapes. Teasing aromas of ripe peach, apricots and mango with marzipan and honey; these follow to the palate with mineral tones and abundant acidity adding structure and balance to this not overly sweet beautiful wine. Who needs dessert when you have this?!? 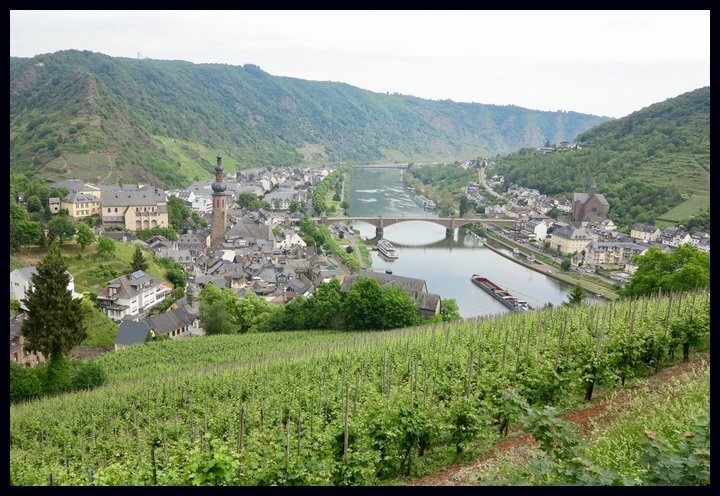 I followed up with Ring who shared that overall the 2018 Cochem area and Mosel harvest is looking good. It was an extremely hot summer with lower than normal precipitation. The grapes ripened three weeks earlier than 2017 and were also drier. This means good sugar levels however aromas were lacking thus Ring let his Riesling grapes hang longer on vine than past years. 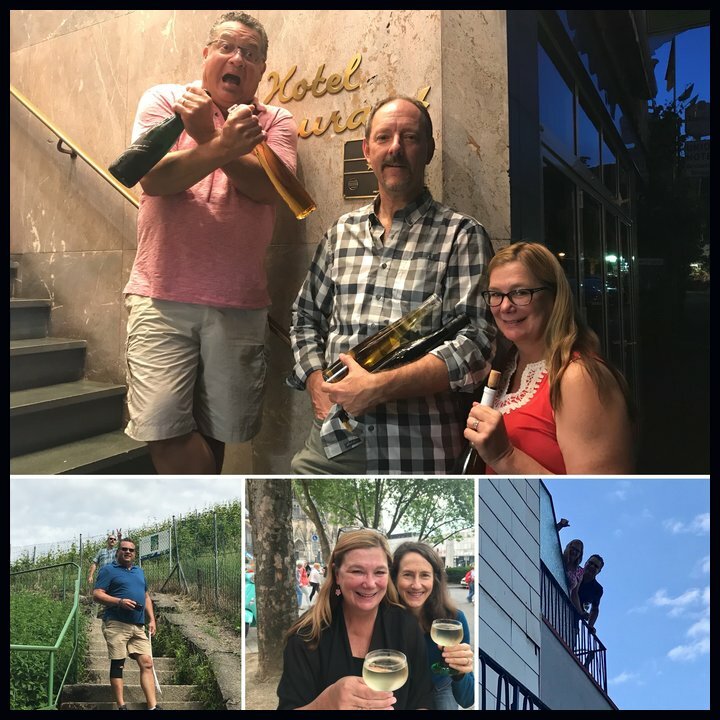 …with our close wine friends and convincing them you can always find a style of German Riesling your palate will love; they ended up buying three bottles! 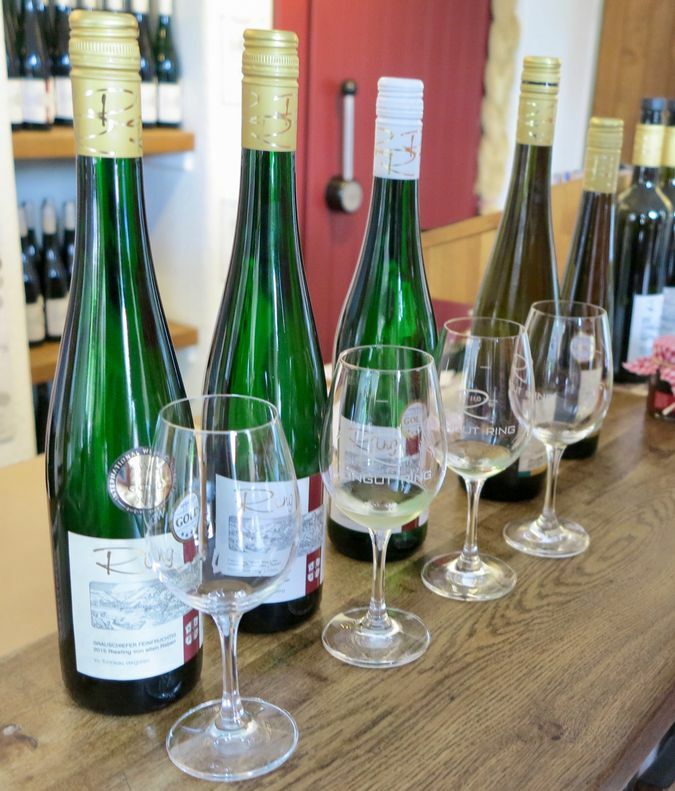 If you find yourself in Cochem, we recommend stopping into Weingut-Ring, especially on Sunday. He produces high quality wines at reasonable prices. You can also hike to the castle above the village for a spectacular view. Go to Weingut-Ring for information about the above wines and their tasting room in Cochem. For more information about the Mosel Valley, go to the Wines of Germany website packed with great information! “”The VDP essentially identifies top producers from each growing region by admitting to membership only those producers that it deems to meet certain criteria—which include maintaining lower yields and practicing sustainable viticulture. The vineyards in each region are then separately classified, much like those of Burgundy, by looking at a number of factors, including historical designations of superior vineyards, the vineyard’s hillside location and exposition, and whether wines of that vineyard are age worthy and consistently expressive of distinctive traits and characteristics. Under the latest version of the VDP’s governing charter (adopted in January 2012), vineyards in most of the wine growing regions represented within the VDP are designated by four tiers: Grosse Lage (the top level, comparable to Burgundy’s grand cru), Erste Lage (the equivalent of Burgundy’s premier cru), Ortswein (equivalent to Burgundy’s villages) and Gutswein (basically regional wine). Where a vineyard is owned by more than one producer, the vineyard classifications are carried out by the regional associations. Instead of these four tiers, regions can opt for a three-tier system where the top tier is Erste Lage. This is the option chosen by Mosel-Saar-Ruwer and Rheinhessen. The Rheingau region is still phasing in the four-tier system. Kabinett: made from fully ripened grapes. Usually lighter wines with lower alcohol. Spätlese: riper grapes usually picked at a later stage in the harvest, more intense flavor and concentration, dry and versions with residual sugar are made. Auslese: made from selected, very ripe bunches, more intense still, dry and slightly sweet versions. 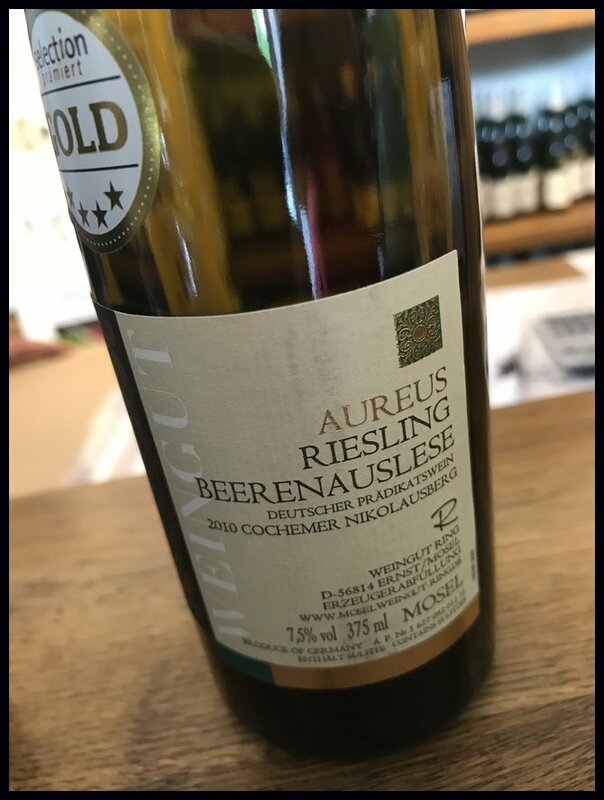 Beerenauslese (BA): made from individually-selected, overripe berries usually infected by Botrytis cinerea (noble rot). Made only when exceptional weather conditions enable development of botrytis; can age for decades, rich and sweet. Eiswein: made from grapes as ripe as BA, but harvested and pressed while frozen. Concentrated, aromatic, fruity acidity and sweet. Trockenbeerenauslese (TBA): individually-selected, over-ripe berries almost raisin-like, commonly infected with botrytis. Extraordinary longevity. Rich, sweet, luscious, honey-like. Great post, Lynn! From the tasting notes to the geeky details, you’ve made me feel like I was on the trip too. My favorite part, though, was the conversation with Herr Ring; what a treasure trove of passion and information. Cheers! Thanks Lauren, I know you get connecting and forming that bond, nothing like it! Loved this article Lynn and enjoyed living vicariously through you to a region we can’t wait to get to. You’ve thoroughly inspired us for a future AdVINEture and hope it will be with you & Mark! Bam! The Mosel is spectacular and such an “under-appreciated” region. And perhaps one of the more beautiful river-valley-strolls one can take. Your vivid imagery display and connectivity with people in this article is lovely. Wine. People. Things that go well together…. The Mosel is definitely a place to go for strolling, hiking, cycling along the river. And good times with friends- yes! I’ve just recently started exploring German wines. After sifting through the top layer that seem to be sent to the US, I’m finding dry versions which I like very much. I’d love to taste the two you discuss here that are non-traditional styles. Thanks for sharing what seems to be a smaller winery with reasonable prices! This is definitely a smaller producer Marge. 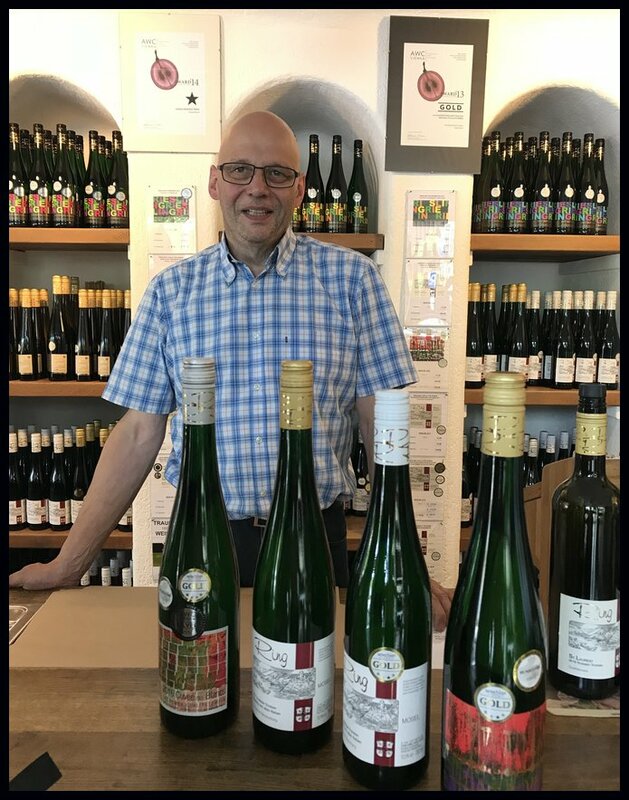 While he makes traditional Riesling (and quite good I might add) and also experiments with other wines like the MOZAIK and ARS. You should send a message, you never know, he might be able to send you some wine!